On 5th of December 2018, Commandant of the Baltic Defence College (BALTDEFCOL) Major General Andis Dilāns recognised General (ret.) Knud Bartels and General (ret.) Hans-Lothar Domröse as Honorary Fellows of the Baltic Defence College. Both generals have significantly contributed to the development of education of the Baltic Defence College and to the enhancement of the security of the Baltic region for several years. Gen (ret.) Bartels visited the College already in 1999 supporting the vision of creating such Professional Military Education (PME) institution and recognising its value for regional cooperation and education. Throughout the years, he has delivered lectures to the students of Senior Leaders’ Course, Higher Command Studies Course and Joint Command and General Staff Course. Gen (ret.) Bartels’ high quality lectures at the College have always received very good feedback from the students’ body and faculty. He has been promoting the image of the College and his constant presence and readiness to support education, even in short notice, are highly valued and appreciated. Gen (ret) Domröse has been closely linked to the College since 2014. He has delivered several lectures at the BALTDEFCOL and has also been the Visiting Senior Mentor for the Senior Leaders’ Course over the last three years. His dedicated approach to education and mentoring has always gained high respect among the military and civilian participants. During his visits to the College, GEN (ret) Domröse has also delivered lectures to the students of the University of Tartu (UT), by thus contributing to the enhancing of cooperation between UT and BALTDEFCOL and supporting the recognition of BALTDEFCOL in academic environment in Tartu and Estonia. 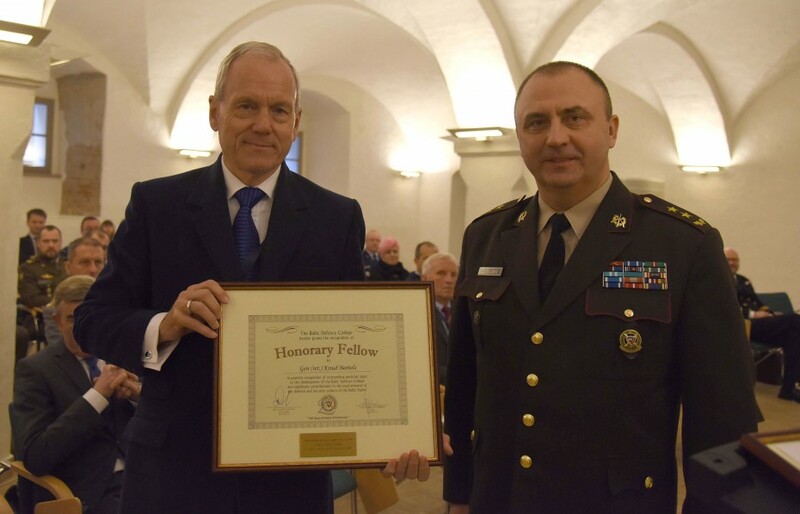 Honorary Fellowship is a highly prestigious award bestowed to distinguished individuals who have made either an outstanding personal input to the development of the Baltic Defence College or who have significantly contributed to the improvement of the defence and security culture of the Baltic states.